Is good communication like an arithmetic equation: the same on both sides? Is it possible not to communicate in times when everything can be interpret as a sign? Is noise during the communication valuable? What differs the visual communication from the verbal one? What if the communication channel has not been properly chosen – what are the consequences for the message? Here you van find the stakes between very well-known model of communication developed and carefully described in a text called: The Mathematical Model of Communication by Claude Shannon and Warren Weaver with special emphasis on its part called Recent Contributions to The Mathematical Theory of Communication and its possible use in visual art. According to John Fiske the model is „widely accepted as one of the main seeds out of which Communication Studies has grown.” Claude Shannon and Warren Weaver were engineers working for Bell Telephone Labs in the United States. As engineers their main task was to ensure the maximum efficiency of telephone cables and radio waves. 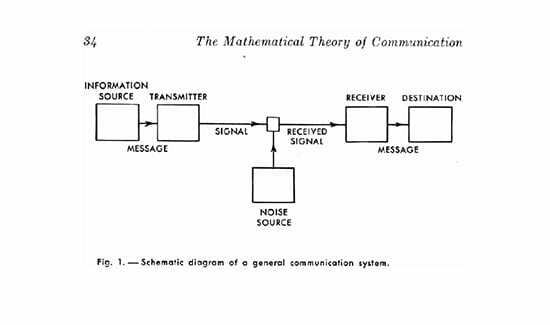 They developed a model of communication which was intended to assist in developing a mathematical theory of communication. However, a major problem with this kind of application is that everyday usage of the model distort and simplify his first destination. My main goal here is to look closer on question how much of this mechanistic model can be applied toward art. Where are potential dangers and what kind of benefits for artistic practice may be offered from better understanding of this theory. According to Jon Fiske, Their basic model of communication presents it as a simple linear process. Its simplicity has attracted many derivatives, and its linear, process-centrednature has attracted many critics. But we must look at the model before we consider its implications and before we attempt to evaluate it. The model is broadly understandable at first glance. Its obvious characteristics of simplicity and linearity stand out clearly. The structure of the model can be represented as follows: The first element is called an information source, it is the one which produces a message. The second element is called a transmitter, it is the one which changes, encodes the message into signals. The third element is called a channel, it is the one through which signals are transmitted. The fourth element is called a receiver, the role of it is to decode the message from the signal. The fifth element is a destination, it is the final goal to which the message arrives. A sixth element is called a noise - they could be any kind of errors or unwanted, undesirable factors travelling along the channel. In conversation I am an information source, my mouth is the transmitter, the signal is the sound waves which pass through the channel of the air and your ear is the receiver, you are the destination. In exemplary possible situation in art the information source can be an artist, transmitter can goes in pair with a work of art which send a signal though a channel considered as a medium through which a work of art appears. 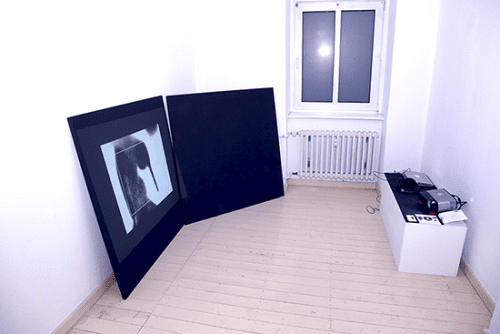 Receiver can be an interpretation of work by thedestination considered as a viewer.